Congratulations to Qinying on receiving the Drug Action Pharmacology Fund Travel Award! 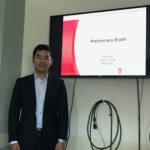 Congratulations to Dr. Zhengwei (Tony) Chen on successful PhD thesis defense! Li Lab had a double celebration this noon to congratulate Li Lab’s #37 PhD Dr. Amanda Buchberger Jones and #38 PhD Dr. Zhengwei (Tony) Chen. Congratulations to both of them for their achievements and best wishes as they move on to their new positions later in the summer! Congratulations to Tony, Qing, Ling, Jill and Zichuan on their publication that featured as back cover of the recent Analyst journal! Congratulations to Jingwen, Chuanzi and Xuefei on their publication in the Special Issue of Electrophoresis titled “Capillary Electrophoresis/Liquid Chromatography‐Mass Spectrometry 2018” ! Congratulations to Yuzhuo (Zoe), Kellen, Limei, Junhua and Rob on their publication featured cover of the May issue of JASMS! Congratulations to Dr. Amanda Buchberger Jones on successful PhD thesis defense and receiving the WISL PhD thesis award! Li Lab members had a great time at the 66th ASMS Conference in San Diego. It was wonderful to see everyone and had a chance to catch up with alumni. The group presented 23 posters and several orals during the conference and workshops. Look forward to seeing everybody again next year in Atlanta! Congratulations to Kellen on receiving the NRSA Fellowship! Li Lab members presenting their research and meeting with UW alumni (including Li Lab alumni Dr. James Dowell and Dr. Di Ma) at the Pharmaceutical Sciences Graduate Student Retreat last Friday! Li Lab members attending the Chinese American Chemical Society Great Lakes Chapter 22nd Annual Conference (GLCACS) held in Abbott Laboratories, IL last Saturday. Congratulations to Zhengwei (Tony) on receiving the Student Research Presentation Contest 3rd prize! Congratulations to Kellen on successfully passing her Research Proposal (RP) and become a PhD candidate! Congratulations to all the GSFLC travel awardees from our lab: Pingli, Kellen, Caitlin and Jingwen! Congratulates to Yusi on successfully passing her thesis background oral exam (TBO)! Congratulates to Zihui(Jerry) on successfully passing his thesis background oral exam (TBO)! Congratulations to Kellen and Amanda on their publication in Journal of Experimental Biology! Congratulations to Yusi and Zihui (Jerry) on receiving 2018 Schrag Fund Pre-Dissertator Travel Grant! Congratulations to Matt, Qing and Zhengwei(Tony) on their publication in International Journal of Mass Spectrometry! Congratulations to Chris on successfully passing his TBO today! Li Lab members at the Wisconsin’s Alzheimer’s Disease Research Day in the Discovery Building. Nice job on poster presentations by Tony Chen and Xiaofang Zhong! Li Lab members having fun in Pharmaceutical Sciences Research Poster Session. Congrats to Jingwen for winning the Pharmsci graduate student poster award! The National Institutes of Health has awarded Li a R01 grant for her research in Alzheimer’s disease biomarker discovery. The major goals of Li’s project are to develop a multi-disciplinary approach to enable identification of biomarkers in Alzheimer’s disease in cerebrospinal fluids collected from patient cohorts at different stages of the disease that offer improved sensitivity and specificity for diagnosis and predict dementia onset and progression. Li Lab 2017 Christmas group party took place in Ichiban restaurant! Congratulations to Pingli for passing her ORP and becoming a Ph.D. dissertator! Article Published on MCP, good job all! Li Lab Pharmaceutical Sciences PhD student Jillian (Jill) Johnson has been awarded the 2017 William J. Tillman Teaching Award, in recognition of her outstanding work in the Fall 2016 course Pharmacy 800, Scientific Integrity & the Responsible Conduct of Research. Congratulations Jill! Congratulations on Yu Feng winning graduate student travel award! Congratulations to Yu Feng for passing his prelim exam and being a Ph.D. dissertator! Li Lab has received R01 grant from NIH to continue innovative research in application of mass spectrometry-based technology and strategies to understand the roles of signaling peptides in feeding behavior: https://pharmacy.wisc.edu/r01-renewal-allows-li-to-continue-innovative-research-in-food-intake/. Congratulations to Qing, Matt and Yang on their publication in Analytical Chemistry! Li Lab has received multi-year funding support from NSF to further study neuropeptides involved in environmental stress via multifaceted mass spectrometry approaches. The research will contribute to a better understanding toward neuroendocrine regulation mechanism in response to external/internal stimuli. Welcome REU undergraduate student Yijia Wang from USTC and Richard Shipman from UW-Stout joining Li Lab to perform research this summer! Welcome our new postdoc Dr. Junfeng Huang joining Li Lab! The Li lab spent a busy week at the 2017 ASMS Annual Conference in Indianapolis last week. Our lab gave 22 presentations and had a great time catching up with some of the Li Lab alumni and also learning about the latest and greatest in the field. Congratulations to Ling Hao on successfully passing her PhD thesis defense! Congratulations Dr. Hao! Congratulations to undergraduate assistant Mengzhou (Clara) Hu (mentored by Kellen, Sheila and Amanda) on winning the presentation award during the Chemistry Undergraduate Poster Symposium! Other undergraduate assistants Kylie Helfenbein (mentored by Kellen, Sheila and Amanda) and Catherine Pearce (mentored by Jill) also did a great job presenting their work! Congratulations to Yusi Cui on receiving University Housing’s Honored Instructor Award! Congratulations to Qinjingwen Cao on receiving WARF Discovery Challenge Research Symposium peer choice award! Congratulations to Qing Yu on successfully passing his PhD thesis defense! Congratulations Dr. Yu! Congratulations to Bingming Chen on successfully passing her PhD thesis defense! Congratulations Dr. Chen! Congratulations to Zichuan Tian on successfully passing his Thesis Background Oral exam! Congratulations to Pingli Wei on successfully passing her Thesis Background Oral exam! Congratulations to Kellen Delaney on passing her Thesis Background Oral exam! Congratulations to Caitlin Keller on passing her RP and becoming a PhD dissertator!